How to Eliminate Dry Cleaning Odors. Though the dry cleaning industry is gradually turning "green" or becoming more natural and organic, not all businesses have made the switch. Traditional, or "old fashioned," dry cleaning is done with a solvent called perchlorethylene (perc). Perc is a petroleum-based solvent that is a very effective cleaner. Due to the chemical makeup of perc, dry cleaning that is fresh from the machines can often emit unpleasant odors. There are many methods to use to eliminate dry cleaning odors. Remove the plastic bag from your dry cleaning when you take it home, but save it in case you need it later. 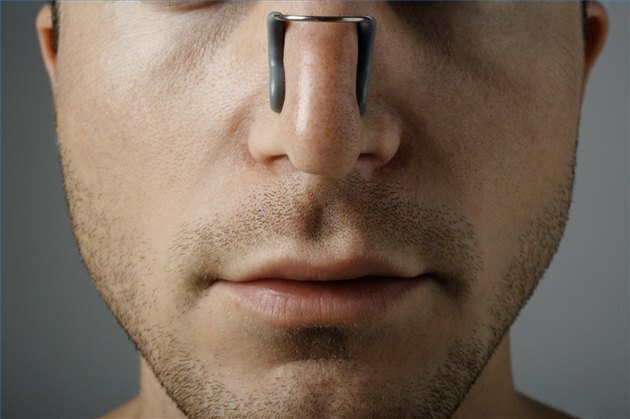 Do a sniff test to see whether there are strong odors coming from the clothing. If there is no discernible smell, hang your clothing without the bag to prevent a musty odor from developing. Hang clothing in the sun or in another warm area if you detect minor dry cleaning odors. There is some leftover solvent on your garments. Letting the solvent evaporate will eliminate the unpleasant odor. Run a hot bath and add some white vinegar to the bathwater. Hang the dry cleaning, without the plastic bag, in the steamy bathroom. The vinegar may absorb some or all of the odor. Try putting your dry cleaning on a low heat, permanent-press cycle of your clothes dryer. Running the dryer for a few minutes may help evaporate any excess solvent. Put some baking soda into a cotton tube sock and tie the sock closed. Tie the plastic dry cleaning bag closed around your clothing, with the sock in the bottom. The baking soda should eliminate the odors within a few days. Knot the plastic bag around the clothing to make an airtight seal. Lay envelopes filled with dry coffee grounds in the bottom of the bag. Coffee, like baking soda, is a good neutralizer and should absorb any chemical smells left on your clothing. Return to your dry cleaner with the odorous item and your receipt. If the smell is very strong, the cleaner may need to put it back into the dryer to absorb the solvent. You may need to leave it there for a few days. To avoid unpleasant odors in your clothing, take your items to a green dry cleaner that uses carbon-based solvents instead of perc. Clothing cleaned in liquid carbon dioxide usually does not have residual odors.